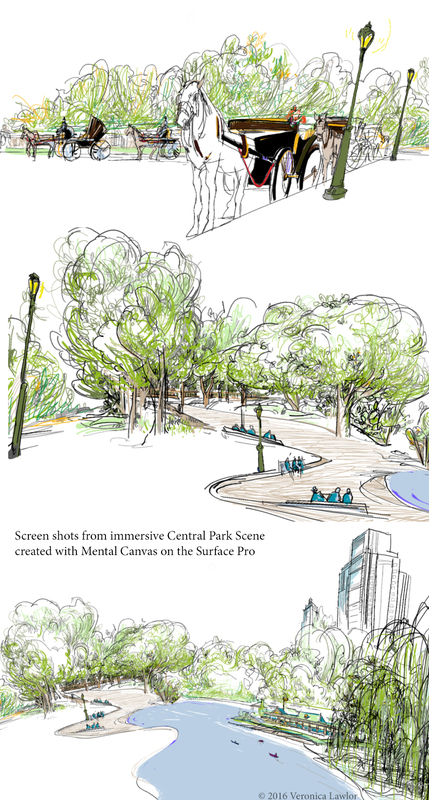 Above are some screen shots of a drawing of Central Park that I created digitally. The difference with this drawing is that it is totally immersive – you can move into it, pan around it, let it move past you – this is a dream come true for draftsmen! I did this drawing using Mental Canvas, a new 3D drawing technology that I have had the privilege of working with. I demonstrated this technology on the new Surface Studio device at the Microsoft event in New York City this past week – great day, and great new way to draw/think on a computer! A short video that shows some of this in motion can be seen HERE. You’ll see a little of the drawing above, as well as a drawing of Grand Central by architect Carol Hsiung, and a master Japanese print that was made digital by designer Sydney Shea. A great team to work with, and exciting new possibilities! Mental Canvas is the creation of Yale professor Julie Dorsey, you can read more about it on their website, here.